Oblique aerial view centred on the remains of the fort and the township, taken from the N.
Oblique aerial view centred on the remains of the fort and the township, taken from the NE. General oblique aerial view centred on the remains of the fort and the township, taken from the WSW. General oblique aerial view centred on the remains of the fort and the township, taken from the NE. Oblique aerial view centred on the remains of the fort and the township, taken from the SE. View of Dun Nosebridge from the NNE. Oblique aerial view centred on the remains of the fort and the township, taken from the ESE. 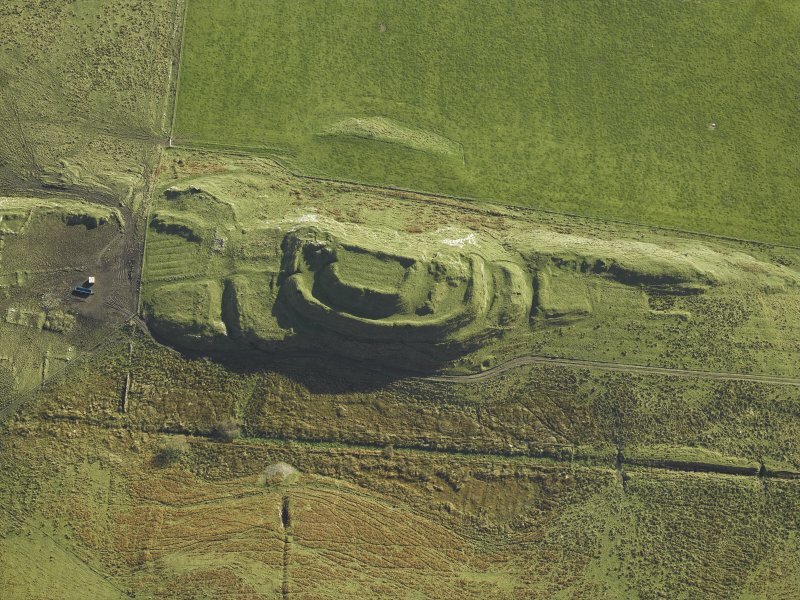 Oblique aerial view centred on the remains of the fort and the township, taken from the NW. 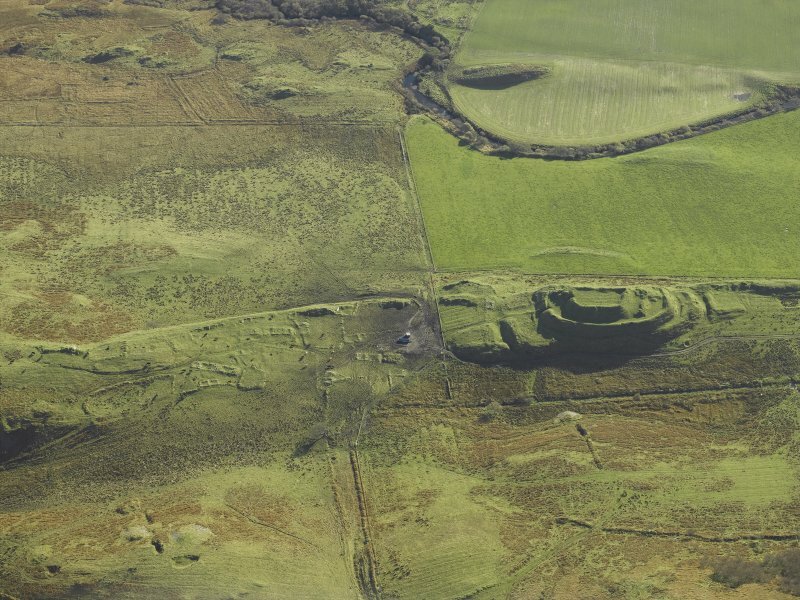 Oblique aerial view centred on the remains of the fort and the township, taken from the SW.
Oblique aerial view centred on the remains of the fort and the township, taken from the E.
General oblique aerial view centred on the remains of the fort and the township, taken from the N.
View of Dun Nosebridge from the NE. Digital image of AG/11081. Oblique aerial view centred on the remains of the fort and the township, taken from the W.
General oblique aerial view centred on the remains of the fort and the township, taken from the NW. General oblique aerial view centred on the remains of the fort and the township, taken from the ENE. General oblique aerial view centred on the remains of the fort and the township, taken from the W.
(Central Islay). 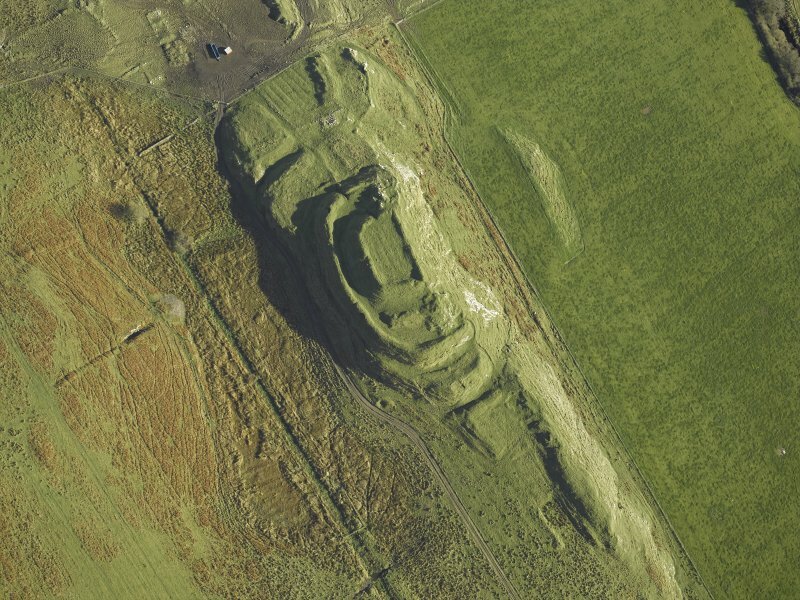 Dun Nosebridge, ?vitrified fort, Mulindry, overlooking [the] upper Laggan valley. An isolated eminence rising above the cultivated lands, is crowned by a rectangular citadel (with rounded corners) 96ft [29.3m] by 55ft [16.8m] from crest to crest of the well-marked rampart. The entrance is in the middle of the N end. The rock falls away sheer on the E, but the slopes elsewhere are defended by two ditches with counterscarp banks, and the SW corner by four. 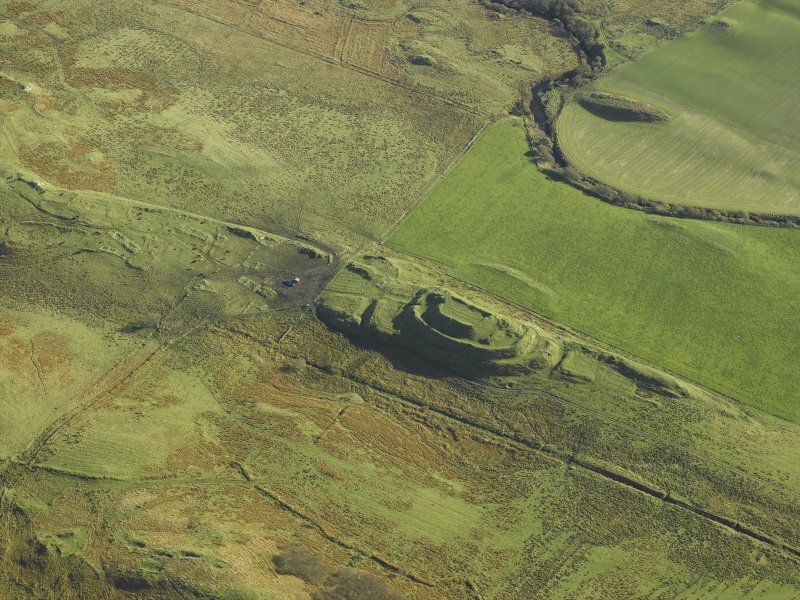 The stone ramparts are entirely grass-grown, and no traces either of vitrifaction or of building were exposed, but the form of the citadel recalls Dunagoil, Carradale, etc. [This monument cannot be identified]. V G Childe 1935 (no. 12). Dun Noesbridge [Nosebridge], a fort, stands on an isolated eminence and consists of a well-preserved rampart enclosing an area 17m by 29m from crest to crest. There is an entrance in the middle of the N end and outworks defend the central citadel everywhere except on the E where the rock face is sheer. The outworks are particularly impressive and consist of two outer banks and ditches except at the SW where there are four. The rectangular shape may mean that this is a small timber-framed hillfort which has not been burnt and vitrified (MacKie 1975). 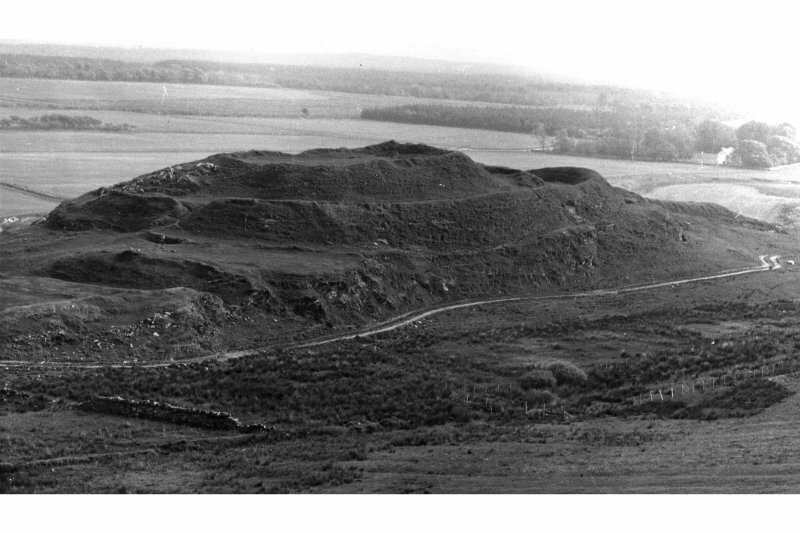 A resistivity survey carried out in 1961 within the citadel indicated only boulders spilling inwards from the ramparts; the readings were not appreciably affected by the lazy beds within the enclosure. V G Childe 1935; W I Carter 1961; E W MacKie 1975. Dun Nosebridge is as described by the previous authorities. 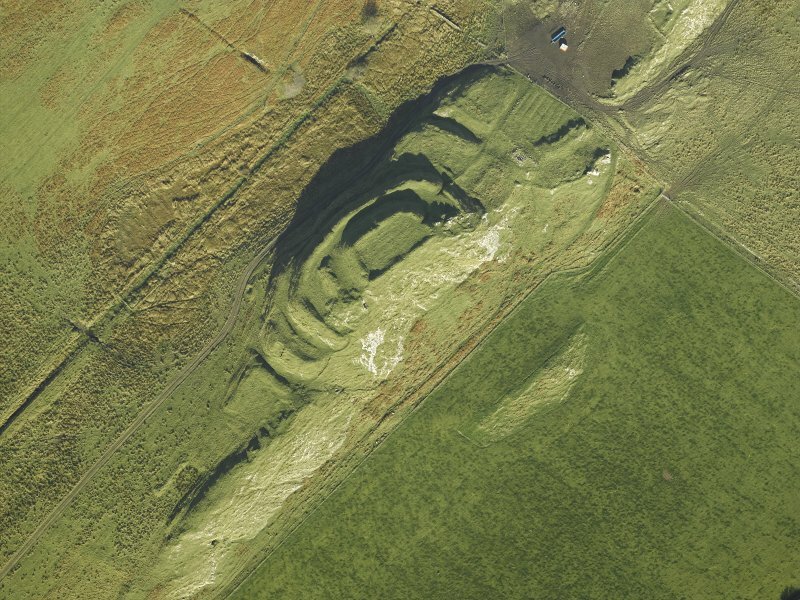 This fort is situated 1km ESE of Neriby farmhouse on an isolated ridge about 15m high; aligned NE-SW the ridge has a steep rocky SE flank, but there is relatively easy access from other directions. To the N and NW the site faces rising ground, but to the S and SE it offers a wide view over the upper reaches of the River Laggan. 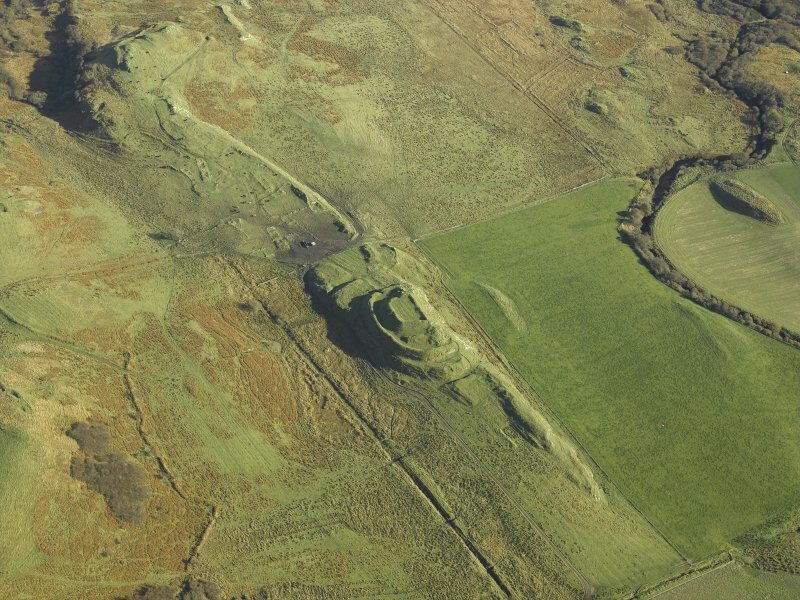 The defences consist of a wall (A on RCAHMS plan), which encloses the summit, and two outer ramparts extending along the NW side and round each end of the ridge, but not continuing along the SE side; a terrace behind each rampart gives the site its distinctive tiered profile. Wall A encloses an area measuring 25m by 15m. No facing-stones are visible, but are a considerable amount of the rubble core material survives, rising 1.6m above the interior at the SW end but not more than 0.3m at the NE corner, near the entrance, which is in the centre of the NE end. The interior contains traces of rig-cultivation (see below). Rampart B (on RCAHMS plan) is set about 3m below the general level of wall A. Like rampart C, it is composed of a mixture of earth and stones, and must originally have been held in position by an external revetment. At the SW end, where it is 2m high internally, it swings away from wall A, leaving an interval of up to 20m between them. Within this space a curving spine of natural rock, representing what was left after quarrying from each side to produce material for the defnces, provides a subsidiary barrier. The ditch immediately behind rampart B is broad and falt-bottomed, its present condition being largely the result of comparitively recent cultivation, a feature noted also at Dun Guaire (NR36SE 9). 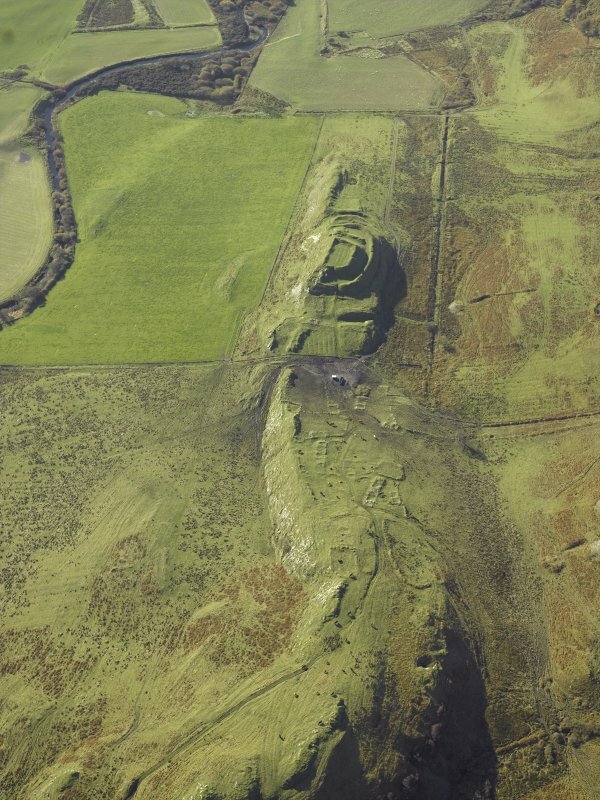 The ditch outside rampart B has been destroyed for the most part, but can be seen crossing the ridge at the SW end, where its scarp is 5m high. The entrance is on the NE. Rampart C (on RCAHMS plan, 1984), for much of the NW side, has been reduced to a narrow terrace whose forward edge falls 6.5m to the track that skirts the foot of the ridge. 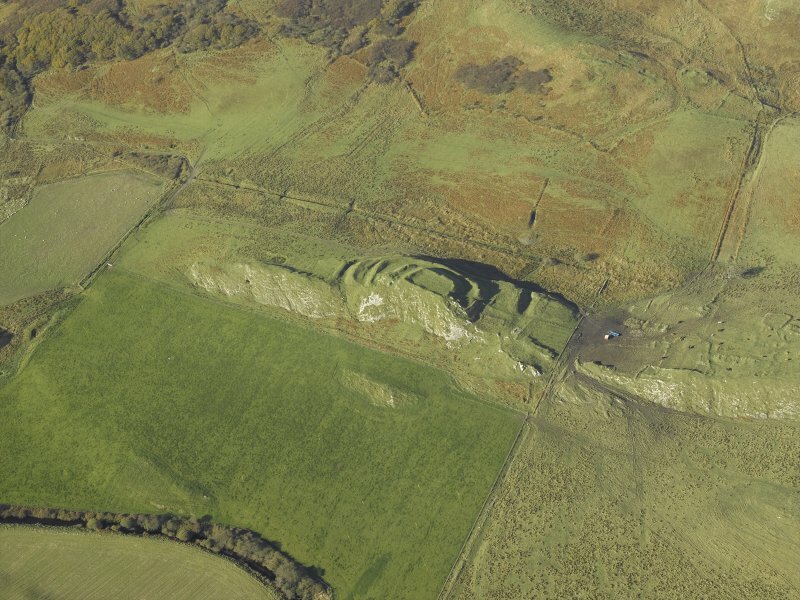 It is about 4m below the level of rampart B and is best preserved at the SW end, where it has a maximum internal height of 0.8m; here it is separated by a berm from the middle ditch, which is about 1m deep at this point, and it rises up to 4.8m above the outer ditch, which is 1m deep and accompanied by a slight counterscarp bank (Don RCAHMS plan) 1m high. 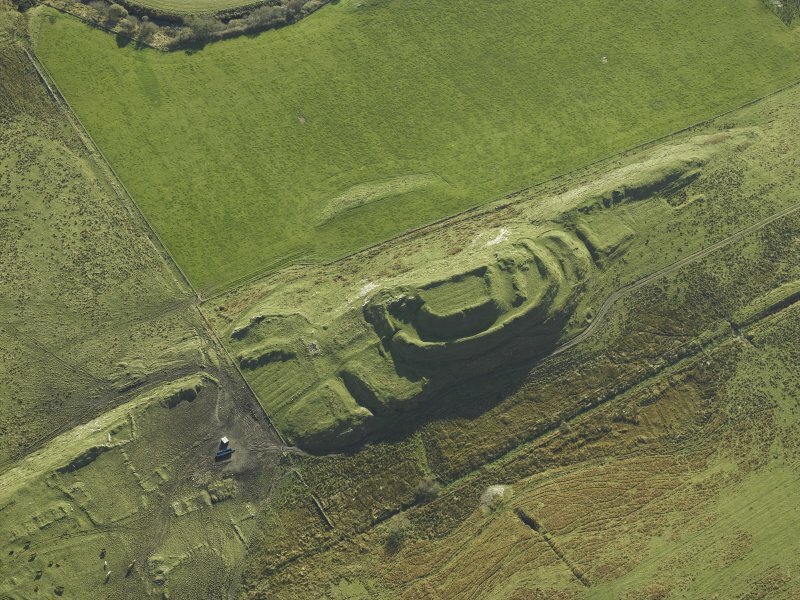 At the NE end there is a wider interval than elsewhere between the ramparts, and rampart C has been almost levelled to the NW of the entrance and totally removed to the SE of it; the scarp of the outer ditch is 2.7m high and the counterscarp up to 1.1m. 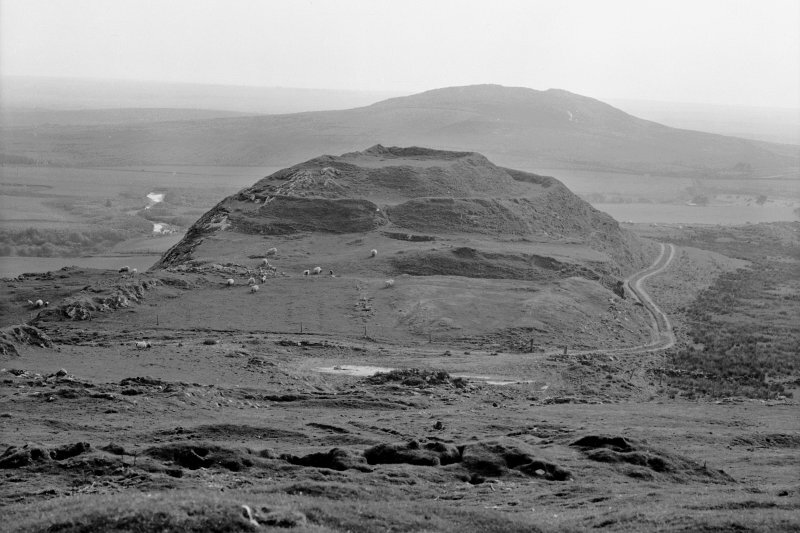 On the SE-facing slope of the ridge which extends to the NE of the fort there are the turf-covered founations of several buildings of late 18th- or 19th-century date (clearances in Nosebridge and other townships in 'The Glen' took place between 1848 and 1853, when the sequestrated Islay estate was being administered by a receiver, James Brown of Edinburgh [Storrie 1981]. Not all of the dwellings were abandoned during this period, however, for a monument in the burial-ground of Kilarrow Parish Church, Bowmore records the death of a person at Nosebridge in 1864). They are of drystone construction and are associated with turf-dyked pits and scoops of uncertain purpose. The buildings are mainly of two or three units and have in some cases been partly erected on terrraced platforms to offset the slope. Further evidence of turf-and drystone-walled field-systems, together with at least two buildings that are identifiable as kilns, can also be found around the base of the rocky cliff SE of the fort. Traces of fairly extensive rig-cultivation are also visible on the sloping ground immediately to the SW of the main ditch-system. 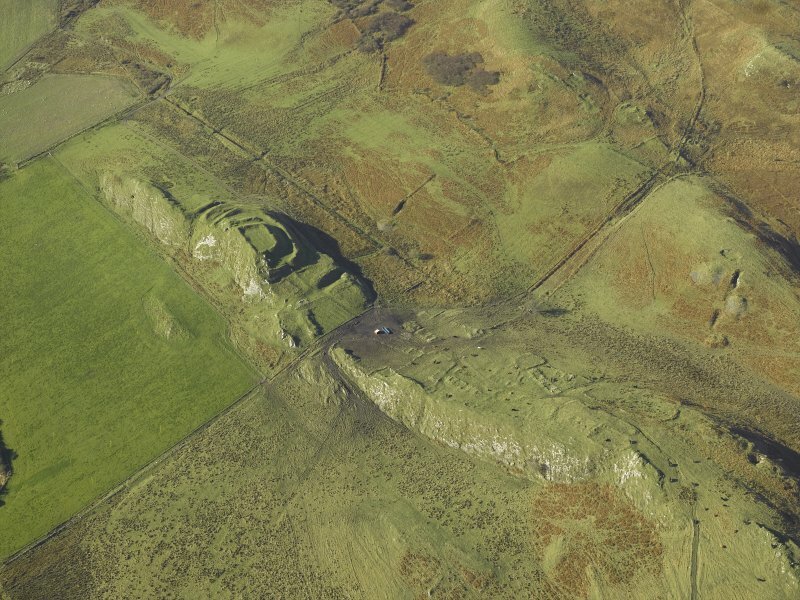 Situated on an isolated grass-covered ridge, this fort is one of the most unusual in the west of Scotland, and its date is quite unknown. 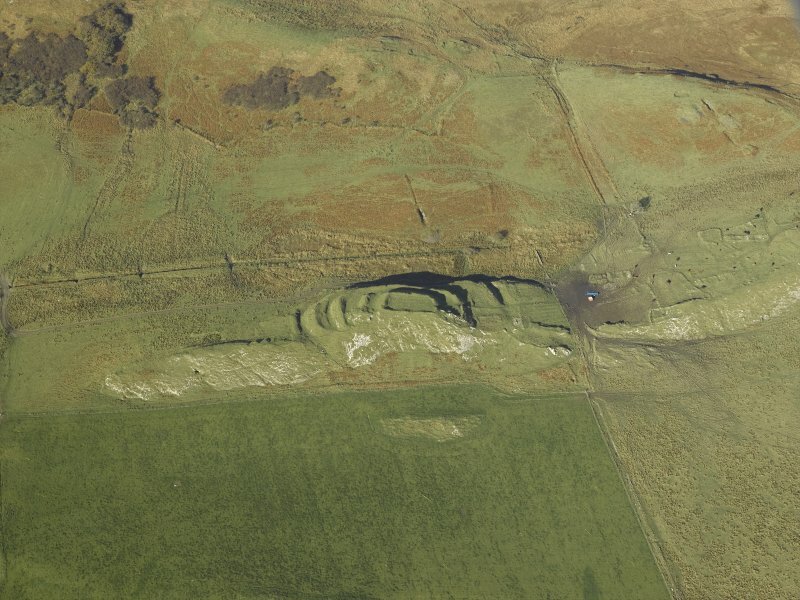 The main defence is a wall which appears to enclose the summit of the ridge (perhaps 25m by 15m). Two outer works partly enclose the fort at lower levels and both include material which has been quanied from ditches on either side. Such a technique, together with the almost rectangular plan of the fort, draws it apart from most of the iron-age defences in the area. In the absence of excavation, however, the date of the fort is uncertain; both the commanding position and the preservation of the various components make this a rewarding site to visit and puzzle over. 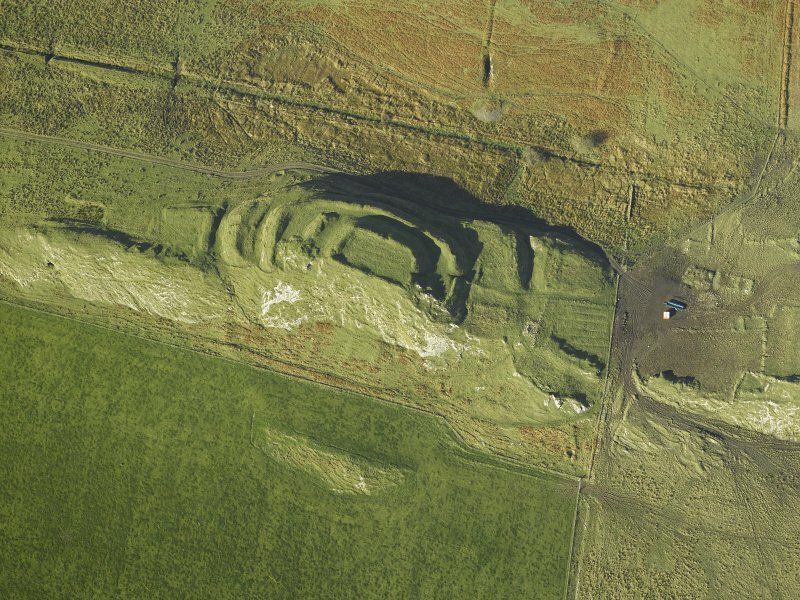 The only comparable site on Islay, Dun Guaire (NR 389648), situated about 500m SSW of Kilmeny farm, is less well preserved. Dun Nosebridge is an unusual fort in the context of Islay, and to some extent the rest of Argyll, not for its position on a ridge rising from the valley floor, with a high crag forming its SE flank, but for its use of ditches in the defences, which rise in three tiers to a relatively small enclosure crowning the summit of the ridge (but see also Atlas No. 2154). Subrectangular on plan, this measures no more than 25m from NE to SW by 15m transversely (0.01ha) within a wall reduced to a bank of rubble that still stands 1.6m high above the level of the interior on the SW and considerably more externally where the flanks of the summit appear to have been scarped everywhere except along the edge of the crag on the SE. 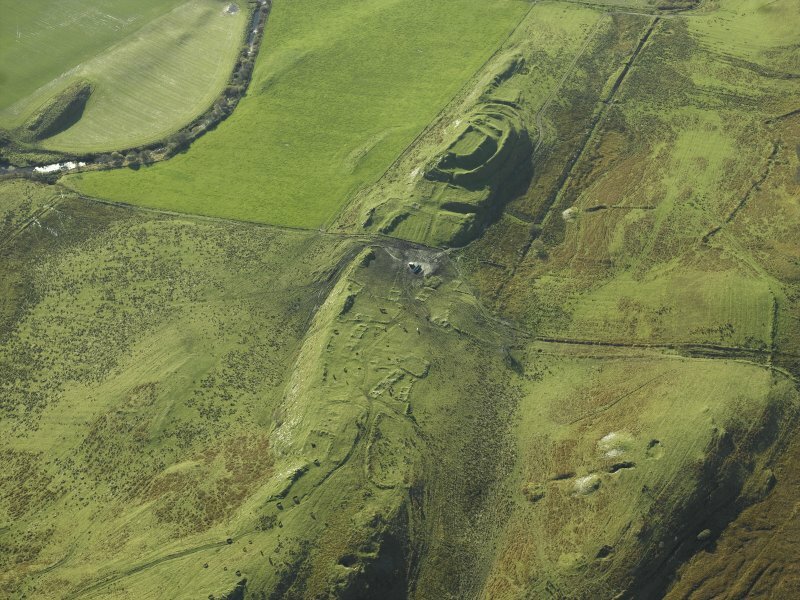 This inner enclosure stands within an outer enclosure that backs onto the cliff edge and takes in an overall area of about 0.18ha within a grass grown rampart up to 2m in height. 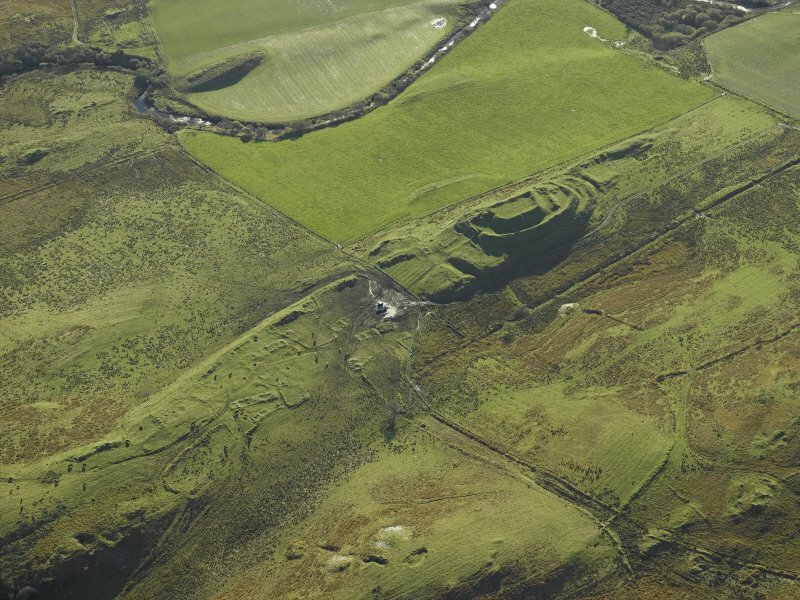 The material for the rampart has been quarried internally and taken from an external ditch which can be traced around the SW and NW. 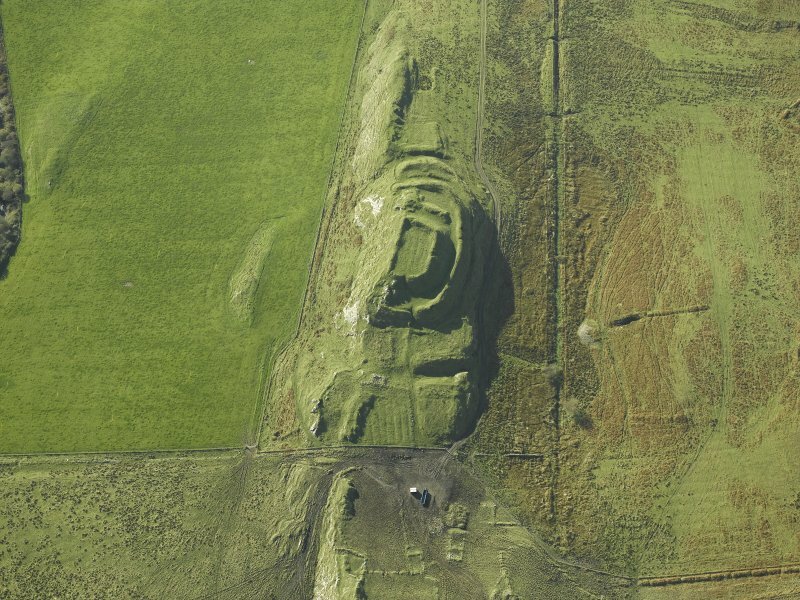 It is unclear whether the inner and outer enclosures are contemporary, but on the W the ditch of the outer appears to have been cut into the back of yet another rampart with a substantial external ditch and a counterscarp bank; following a slightly divergent course across the spine of the ridge on the SW flank, these appear to belong to an earlier scheme, though not one that can now be traced around the NE, where elements of the defences may have been obliterated by the occupation of a later township. A gap in the circuit of the outer enclosure on the NE probably marks the position of the entrance. The interior of the inner enclosure has been cultivated in rigs.